Winter Handicap Records for PGA members. Golfers, golf clubs and competition organizers have differing views on what constitutes acceptable pace of play, but they are all agreed that slow play detracts from the enjoyment of the game for far too many players. There is a responsibility therefore on all players to ensure that golf is played at a good pace and a pace appropriate to their fellow members. All players must maintain their place in the field, which is immediately behind the group in front and not ahead of the group behind. This is a group responsibility and not an individual one. All members should be proactive in addressing the slow play problem. Should your group fall a clear hole behind (e.g. you are on the tee of a par four or par 5 hole and the previous group has already left the green) and it is delaying the group behind, please invite the group behind to play through (irrespective of the number of players in that group). No more than 3 minutes is allowed to search for a ball. If you can’t find your ball in 3 minutes you must proceed under normal rules of golf. If more than one ball needs to be found, split up and search for all the balls at the same time. Fishing for golf balls, other than your own or a fellow member in the group, is not acceptable especially if it holds up the pace of play. If you hit a ball that you think may be hard to find, or it may be out of bounds, hit a provisional ball. Go to your ball and get ready to hit your next shot as soon as it is feasible to do so but not impeding another player’s shot or endangering yourself. Don’t always wait for your playing partner to play before going to your ball. Short hitters should tee off first and you should walk briskly between shots. Leave your golf bag, strategically placed to the side of the green nearest the next tee. When you reach the green, move to your ball and repair any pitch marks. Where possible, line up your putt prior to your turn to putt. If your ball needs to be marked, then do it as quickly as you can. Anticipate the requirements of your fellow player. Move back and line up your putt. Except in match play or where you will stand on someone else’s lie, when you start putting, continue until you have holed out if possible. If you can no longer score on a hole, pick up your ball and let others continue. Players should proceed to the next tee without delay. Cards should be marked as quickly as possible after completing the hole, but it is best to mark the cards at the next tee. Please mark your card when it is not your turn to play. We pride ourselves on the condition of our amazing greens throughout the year. However, such playing surfaces can only be maintained if all golfers repair their pitch marks on the green. We would ask you to ensure that all players within your group adhere to this policy. The association aims to promote both social and competitive golf activities with a view to developing a friendly and pleasant environment in which members can meet and play a round of golf. The members meet every Thursday morning from 9 am onwards and registration for each day’s golf is through the Chronogolf system which ensures that everyone gets an opportunity to play with as wide a range of members as possible. All members of Castleknock golf club who are over 55 are eligible to join the society on payment of an annual subscription agreed at the yearly AGM, however, in order to maintain the social aspect of the society, a cap on numbers may be put in place. The society’s Annual General Meeting is held in early January. Pursuant with the aims of the association, it is expected that as a courtesy to all, that members will remain after the golf for good-natured bonhomie and most importantly the presentation of prizes. The committee will as always endeavour to perform the presentations as quickly as possible, depending on how quick the scorecards can be checked and verified. The Committee will arrange and run a variety of different golfing formats during the year, including approximately 4 away trips to courses of eminence and consequence. We encourage all members to participate in these events and information about golf events will be posted on the Club’s website as they arise. The association encourages prompt play and the maintenance of a reasonable tempo and our esteemed committee have the authority to ask you to speed up play if required. We ask you to respect the committees’ role and give them your full admiration, adulation and acclaim. The decision of the committee in relation to the flow of play on the course is binding on all golfers. In extreme or persistent cases of slow play, you may be asked to forfeit the hole you’re playing and move to the next tee box. This is done only as a last resort, to ensure other golfers do not suffer from the actions of a few miserable gits and is in preference to hanging, drawing and quartering that some of the committee feel is justified. Handicaps and handicapping for Winter. The committee has decided that winter golf will be played over the first 15 holes and from the green tees. The 15 hole course has been set up on the computer in the pro-shop and the indexes recalculated accordingly. A new scorecard for the 15 holes will be on the desk in the pro-shop. 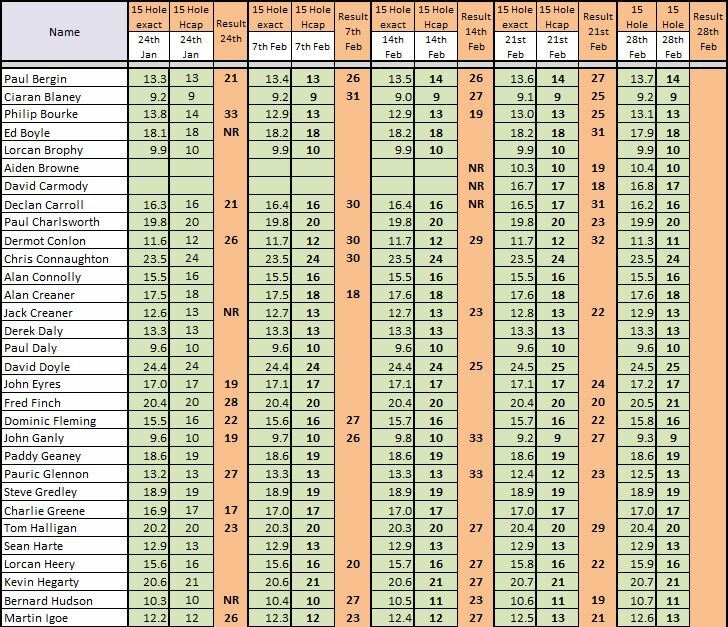 The handicaps will be updated weekly based on the result of the previous week and your exact handicaps will be calculated in the same way as for qualifying golf. The CSS will be set at 30 Stableford points or at 60 if playing medal. There will be a buffer zone of 2 shots below the CSS. A reduction of the handicap of 0.1 will apply for golfers with a handicap of less than 5 for each shot above the CSS. A reduction of the handicap of 0.2 will apply for golfers with a handicap between 6 and 12 for each shot above the CSS. A reduction of the handicap of 0.3 will apply for golfers with a handicap between 13 and 20 for each shot above the CSS. A reduction of the handicap of 0.4 will apply for golfers with a handicap between 20 and 28 for each shot above the CSS. A reduction of the handicap of 0.5 will apply for golfers with a handicap over 28 for each shot above the CSS. An addition to the handicap of 0.1 will apply for players below the CSS -2. Remember: All players play off their PGA handicaps. All disputes, complaints and requests for clarification shall be addressed to the Committee as soon as practicable. Committee decisions in these matters are final and shall be binding on all parties.